Devolver Digital, the publisher behind Hotline Miami and Shadow Warrior 2013 has revealed its latest offering: Heavy Bullets, a First-Person Shooter for the PC, Mac and Linux with a number of unusual twists. 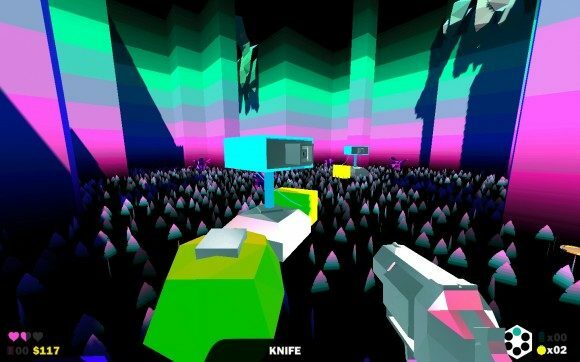 Developed by one man, Terri Vellmann, along with the aid of a community of gamers and sound designer Doesone, Heavy Bullets features a very basic premise, in which you must navigate an eight level maze infested with hostile creatures and psychotic security systems in order to shut down the maze’s security mainframe. The twist is that for the most part, you will be armed only with a six-round revolver, with bullets that must be collected after they are fired, making combat an extremely methodical affair that must be thought out instead of blitzed through. The game also features helpful items that can be equipped alongside the revolver, such as homing bombs, coin magnets and a teleporter, but only one of these can be held without a backpack. Death in Heavy Bullets is permanent, but the player can purchase Life Insurance or a Last Will that will allow his or her equipment to carry over to a subsequent playthrough. The game also features a unique neon color scheme and simplistic graphics that bring artful games such as the surreal Killer 7 to mind. For more information, check out the official website.